The Nissan Mentored Apprenticeship Program (NissMAP) is a world class Mentored Apprentice Technician Program. 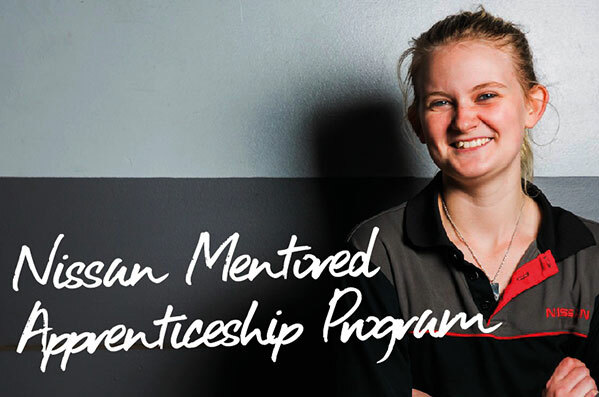 The program offers an accelerated automotive apprenticeship, delivered in state of the art training facilities in Queensland, New South Wales, Victoria and Western Australia in conjunction with the Nissan Learning Academy. As an apprentice you will study in Nissan dedicated classes, working on Nissan components to ensure you keep up to date with the latest advancements in technology. Qualification: Upon completion all NissMAP apprentices will receive a nationally recognised Certificate III (trade certificate) relevant to the state or territory and a Certified Nissan Technician Certificate from Nissan Australia. NISSMAP apprentice Ashlee Poole – Kangan Institute’s Apprentice of the Year. Victoria has shown categorically, that there is a very valued place in the automotive industry for female apprentices and technicians. Ashlee currently attends her NISSMAP block release training at the state of the art facility in Melbourne’s Docklands, known as the Automotive Centre of Excellence. Her factory trained NISSMAP teacher George Orfanidis was delighted with Ashlee’s award saying that “she really goes above and beyond both at work and at TAFE”. Shortly after the announcement was made public, Anthony (Fred) Frederiksen and Steve Dunn from Nissan Motor Company headed down to Wight’s Nissan to personally congratulate Ashlee. Fred and Steve spent some time with her Service Manager and Workshop Foreman who both commented on how well Ashlee is going, and that she has a bright future ahead. Ashlee then joined Fred and Steve for lunch, as we spoke about Nissan, NISSMAP and her future career. Ashlee is aiming at becoming a Nissan Master Technician which is fantastic to hear. Originally published by Nissan Learning Academy, 2016. Want to to find out about how you can become involved in NISSMAP as an apprentice or an employer? Call Mark on 1300 656 461.